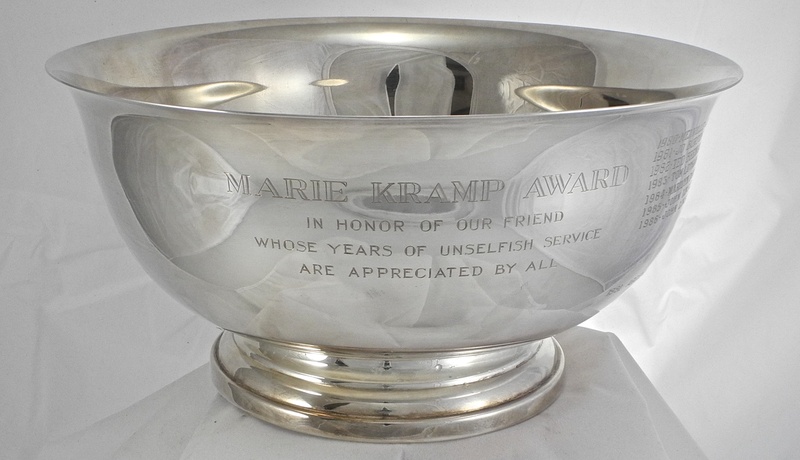 “In honor of our friend whose years of unselfish service are appreciated by all.” These words are engraved on a large Revere bowl as a salute to Marie Kramp, who was a valued employee at Lake Geneva Yacht Club for more than four decades and is remembered to this day with great affection. Mrs. Kramp retired in 1990 and died in 2009. In 1980, members donated the Marie Kramp Award to the Yacht Club to honor her and to recognize a member or members for outstanding service. The trophy’s first recipient, in 1980, was Melville C. Jones, commodore in 1950 and 1951, esteemed A-Scow and iceboat sailor, and a gracious and soft-spoken individual whose service to the Yacht Club was varied and generous. Mel Jones was a creative gardener, and for many years he was a member of the House, Grounds, and Waterfront Committee, usually in charge of landscaping. A tribute to him noted that “Our club’s beautifully kept shrubs, trees, and flower beds are the result of his long hours spent planning, preparing the soil, planting, cultivating, watering, and keeping a watchful eye over all.” To read the names of the members who received the Marie Kramp Award after Commodore Jones, click here.